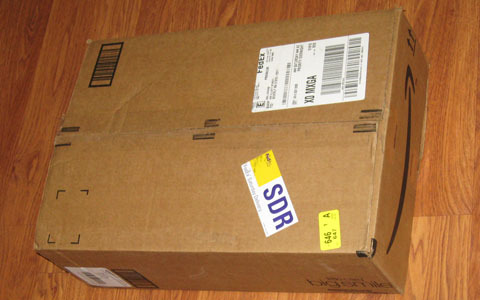 Okay, what happened was...on the morning of the day before my 53rd birthday, I heard sounds of what seemed to be a box "drop" and a scanner "beep" near my front door. Without opening this door, I simply glanced out of a window and spotted a FedEx truck in front of my house. 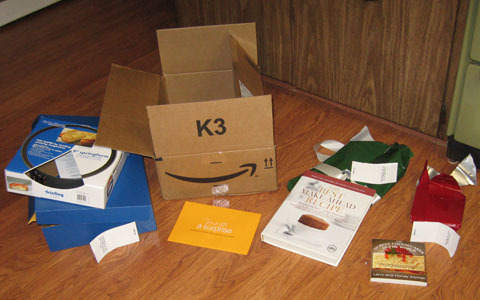 I afterward took in this box, which bore an Amazon.com logo. Before long, I was guessing this "Saturday Delivery" package to be something from my brother (and his household) in California. It was a good guess. I opened the box and found three wrapped presents. A note was attached to each wrapped item. 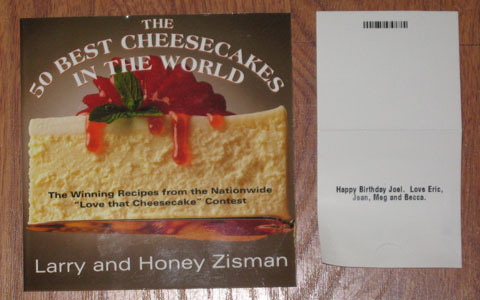 The first gift was a book, The 50 Best Cheesecakes in the World, which came with this note: "Happy Birthday Joel. Love Eric, Jean, Meg and Becca." (i.e., my brother, his wife and their two daughters). 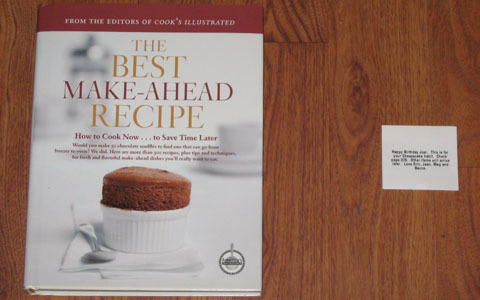 The next gift was also a book, The Best Make-Ahead Recipe, along with this note: "Happy Birthday Joel. This is for your Cheesecake habit. Check page 370. Other items will arrive later. Love Eric, Jean, Meg and Becca." On Page 370 itself, in addition to containing a recipe for New York-Style Cheesecake, there was a top recommendation for a particular springform pan—so guess what the third gift was? That's right! 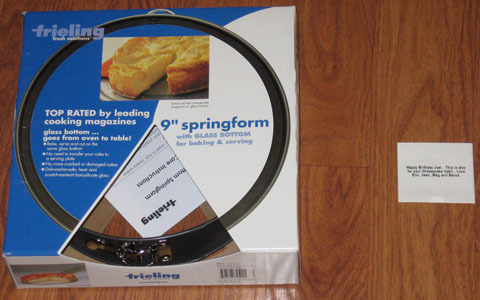 The third gift was that Page 370 endorsement, a Frieling 9" springform pan, with—OMS (OhMySurprise)!—a glass bottom!! Now that was certainly a different kind of cheesecake pan! The accompanying note said, "Happy Birthday Joel. This is also for your cheesecake habit. Love Eric, Jean, Meg and Becca." The Amazon package also contained an envelope which said "keep your gift a surprise"/"unwrap your present before opening this envelope". Figuring that following this sequence would optimize my unpacking experience, I obediently opened my three presents first, including reading their respective accompanying notes. I then anticipated that the envelope would contain some kind of follow-up message from Eric, Jean, Meghan and Rebecca which they would want me to read specifically after unwrapping my presents. 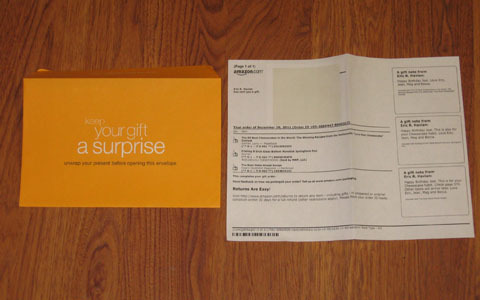 Actually, the envelope's contents turned out to be a packing slip, describing the three enclosed wrapped items. But I could still see the reason for accessing this envelope last—discover the identity of each gift upon unwrapping it, not upon viewing the packing slip! Okay, Amazon.com! Will do (and so I complied)! And so the cheesecake journey rawks on! Thank you, Eric, Jean, Meghan and Rebecca! And now, back to the Recipe Scrapbook!